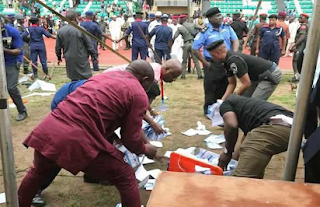 The All Progressives Congress (APC) has said that aspirants whose supporters disrupted Saturday´s governorship primary election in Ekiti would be disqualified from the race. National Publicity Secretary of the party, Malam Bolaji Abdullahi, stated this while speaking with newsmen on Monday in Abuja, shortly after the party’s leadership received report of the primary from the Governorship Primary Election Committee. Chairman of the committee, Gov. Tanko Al-Makura of Nasarawa state, presented the report to the leaders at the party’s National Secretariat. Abdullahi said that the report contained photographs of individuals that disrupted the exercise, and that the leadership would review the report immediately. He said that if permitted by the leaders, he would make the photographs and names of the identified individuals, public. ´´Gov. Tanko Al-Makura gave us a full report orally and submitted a written report of what transpired in Ekiti. ´´They also made specific recommendations which gave the party´s National Working Committee (NWC) a couple of options on how to proceed. ´´But, what I can assure you is that the individuals that took part in disrupting the exercise in Ekiti have been fully identified and we know the people they represent at the event. ´´If we find them to be culpable accordingly, the principal they represent will be disqualified from the exercise and the individuals that participated in disrupting the exercise will be fully prosecuted,´´ he said. Abdullahi, however, added that due to time constraint, the party would not change the committee that conducted the primary, even though it was characterised by crisis. This, he explained, was especially so because the party had only one week left to submit a candidate’s name to the Independent National Electoral Commission (INEC). He added that there was nothing available to suggest that the current committee was incapable of carrying out the assignment. The spokesman maintained that the party would take appropriate steps if it discovered that the exercise was disrupted because money actually changed hands as was being speculated. He said that the party´s leadership was also expecting reports from the aspirants. Abudullahi assured that the ballots from the five local government areas where crisis was recorded was in the custody of the police command in the state, assuring that nobody had tampered with them. He admitted that there were a couple of disruptions across the country during the party’s ward congresses on Saturday, but said that the party could not take a decision until it received committees’ reports. ´´We have not received any report from any state; until the committees we sent to the states come back with report that is when we will be able to react on individual cases. ´´In order to deal with each case, we will have to wait for the committee that was sent to each state,’’ he said.